The encounter that raged between forces and militants in South Kashmir’s Shopian district is underway, police said. 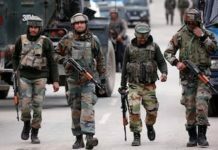 Police said that the gunfight started following the search operations by the joint team of Army and JK police in Kundalan village of Shopian. As the gunfight ensued, scores of youth took to streets and tried to march towards the gunfight site, triggering clashes in the area. Police said that the encounter is underway. “Encounter is in progress in Shopian.details will follow,” Kashmir Zone Police tweeted.